With spring finally here, and glimpses of warmer temperatures; there is a sense of a reawakening around the globe that only this season can provide. The provision to provoke us all to rethink our wardrobe, contemplate lighter shades and remind ourselves of the trend predictions last Autumn, has all become a fashion necessity. Unsurprisingly, floral print was a regular site on the runway during the September fashion weeks; always a foreseeable sighting for the time of year, but for 2019 we see a definitive increase. Feminism has been reinvented, which could explain this escalation for such a design; flowing skirts, longer lengths and homemade represent a new founded sense of strength and self-awareness for 2019. We have also witnessed an increase in celebs donning floral pieces and designers whose ethos is usually of a darker nature are displaying a committed obligation to the power of the flower. As for the form of such a print, if the runways are anything to go by, we are to be inundated with a wonderful array for choice when it comes to all things floral. Bright yellow prints (to the point of almost neon) illuminates freshness and vibrancy, and as we continue with the popularity of individual and inner strength displayed through our wardrobe, such vivacious tones are no longer just for the brave. The protagonist of the floral enterprise for the season is one of my favourites as it’s a bloom attached to positivity and traditional storytelling; the rose. In 2019, this blossom represents an almost ‘laissez faire’ attitude, as symbolic forms of the flower emerge in many designs. I personally remember appreciating such interpretations last A/W on the runway through the dependable Gucci and Vuitton blue. The 1970s ambiance and influence is reigning, and it certainly didn’t shy away from the bloomy scene for this SS19. Floral prints with a convincing 70s feel is defiantly going to excite the high street and therefore its consumers. As an (hobby) artist myself, I find sketching and stencilling produce wonderfully contrasting results and appreciative unpredictability. Clearly, this has the same effect when used on fabric and in design, and the trend of stencilling (for me) is a breath of fresh air compared to the current over-load of recurring digital prints. 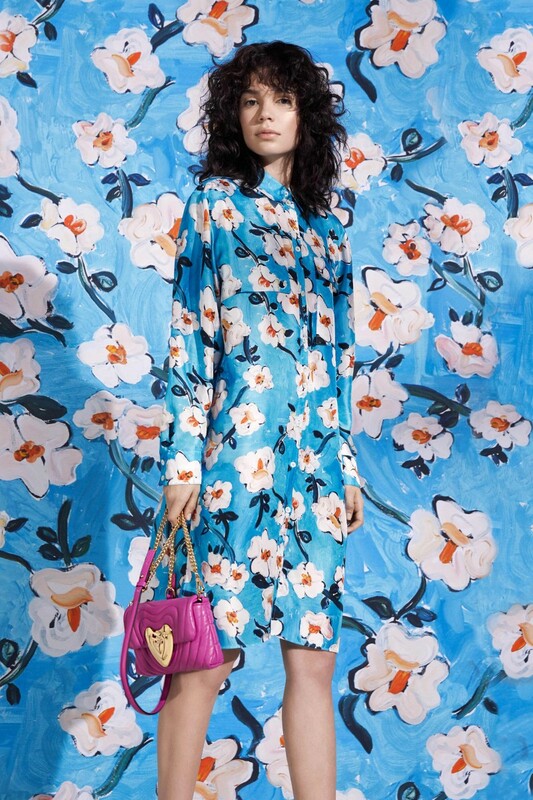 For the season, designers have taken it on themselves to construct some floral prints that look more like stencil work and the results are fabulous. Continuing with the on-trend popularity of mixing trends from diverse categories, this is also the case with finishes and prints. Expect to witness plenty of floral-clashing this SS, in fact the trend seems to be growing stronger each season, but what is different for 2019 is the combination of layering; producing fanciful outfits that can literally be altered as the day progresses. Whatever the style, a change of season announces a favourable time where the closet is concerned. As not only is it about reorganising long-standing attire and accommodating current trends, but its about allowing a time to reflect, to update and move forward, after-all, springtime is the perfect instance for dusting off cobwebs, letting go of the dreary and relighting the sunshine within.